Tommy Handley and Ted Kavanagh wrote the scripts for this very popular wartime programme together with producer Francis Worsley. The name of the programme derived from a topical catchphrase. Whenever Hitler made some new territorial claim, the newspaper headlines would proclaim 'It's That Man Again'. The programme started on a trial basis in July 1939. The setting was a pirate commercial radio ship, from which Tommy Handley broadcast, assisted by Cecilia Eddy as his secretary Cilly, Eric Egan as a mad Russian inventor, Sam Heppner and Lionel Gamlin. These early editions were modelled on Bandwaggon which starred Arthur Askey and Richard Murdoch. ITMA returned in September 1939 for a weekly series in which Tommy Handley was Minister of Aggravation and Mysteries at the Office of Twerps. With a new cast, Vera Lennox as his secretary Dotty, Maurice Denham as Mrs. Tickle the office char and Vodkin the Russian inventor, Jack Train as Funf the elusive German spy, and Sam Costa. One of the regular features was Radio Fakenburg, a send up of Radio Luxembourg which had stopped broadcasting during the War. For the third series in June 1941, the show was renamed 'It's That Sand Again'. It was set in a seedy seaside resort called Foaming-at-the-Mouth, with Tommy as the town's Mayor, Sydney Keith, Horace Percival, Dorothy Summers and Fred Yule. New characters were invented: Lefty and Sam, the gangsters (Train and Keith); Deepend Dan the Diver (Percival), Claude and Cecil, the over polite handymen (Train and Percival) and Ali Oop (Percival), a Middle Eastern vendor of saucy postcards and other dubious merchandise. In September 1941, the show reverted back to ITMA. This time they were joined by Dino Galvani as Tommy Handley's Italian secretary Signor So-So and Clarence Wright as a commercial traveller who never sold anything but didn't seem to care. Dorothy Summers played the office char, Mrs. Mopp, sent by the "Labour" to dust the Mayor's dado. By September 1942, Foaming-at-the-Mouth had a war factory but it was never mentioned what it was supposed to be producing - even the workers didn't seem to know. Colonel Humphrey Chinstrap (Jack Train) made his first appearance, and rapidly became one of the most popular characters. The colonel was a dipsomaniac army officer who turned almost any innocent remark into the offer of a drink with his catchphrase 'I don't mind if I do'. (Jack Train also appeared as Colonel Chinstrap in at least one edition of the Goon Show, as an old army pal of Denis Bloodnok). The following series saw the war factory turned into a spa, a holiday camp and a hotel. 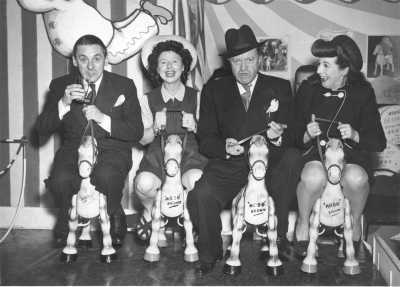 The first post-war series was joined by Carleton Hobbs, Hugh Morton, Mary O'Farrell, Michele de Lys and Lind Joyce. Tommy was now appointed Governor of a South Sea island called Tomtopia. During the journey to this new paradise, Tommy met Curly Kale (Carleton Hobbs), the chef who hated food but loved terrible puns; George Gorge (Fred Yule), a glutton who could eat any quantity of 'lovely grub' and Sam Fairfechan (Hugh Morton), the contradictory Welshman. Accompanying them on the journey was Colonel Chinstrap. The local population included Bigga Banga (Fred Yule), the native chief who spoke only Utopi language, his daughter and translator Banjeleo (Lind Joyce); Wamba M'Boojah (Hugh Morton), another Tomtopian native whose Oxbridge accent was the result of a spell as an announcer with the BBC's Overseas Service and Major Munday (Carleton Hobbs), an ex-British army officer who had lived in isolation since the Boer war and now believed that England was exactly as it had been in the nineteenth century. A year later Tommy was appointed the Governments adviser on industrial and scientific affairs. The series investigated the radio industry, organisation of a fuel saving campaign and a PR programme for England. Hattie Jacques joined up as Sophie Tuckshop, the greedy schoolgirl, whose prandial excesses were invariably followed by a giggle and 'but I'm all right now'. The final series began in September 1948. Down on his luck, Tommy was now a permanent resident at Henry Hall (the tramps guesthouse), run by Miss Hotchkiss. For the milestone 300th episode of 28th October 1948, the setting was Madame Tussaudes Waxworks in London. Here passing through a door marked 'The Hall of ITMA's Past', Tommy was reunited with many favourite characters from Foaming-at-the-Mouth and Tomtopia, with Dino Galvani, Horace Percival, Clarence Wright, Lind Joyce and Dorothy Summers all making guest appearances. The very last ITMA went out on 6th January 1949. Tommy Handley died suddenly of a cerebral haemorrhage three days later. The Radio Times shows that there was an ITMA show scheduled for 13th January, but this was to be replaced by a special tribute programme. After the death of Tommy Handley the BBC wisely decided to let the show die with him. The only surviving character was Jack Train's Colonel Chinstrap. In 1950, the Colonel appeared in a long forgotten series called The Great Gilhooly. 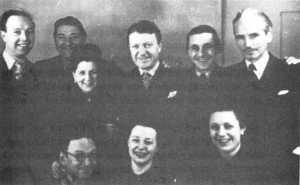 The wartime ITMA cast: From left to right, Clarence Wright, Fred Yule, Dorothy Summers, Sydney Keith, Tommy Handley, Paula Green,Jack Train, Kay Cavendish, Dino Galvani. The march theme which introduced 'ITMA' is called "Tom Marches On" and was composed by Clive Richardson. THE RICH, whisky-soaked voice said: "I don't mind if I do"-- and I was promptly wafted back to an era that is another age and another world away. For I was listening to Jack Train who created the character of Colonel Chinstrap, the bibulous retired Army officer. What memories those names and that catch-phrase evoke for me and for so many millions of people ! Twenty, odd years ago Jack Train was one of the top names in radio. He was one of the regulars in ITMA (It's That Man Again), a show that became a national institution. Tommy Handley, the kingpin of ITMA, is long since dead and most of the others have gone, too. Train is one of the last survivors. What has been happening to him ? He still does a bit of radio work--as a member of the perennial quiz show Twenty Questions and occasionally as a compere on a record programme. He has even appeared recently in a TV commercial -- extolling the virtues of somebody's chocolate. But because he has never established himself in television, he has drifted into the shadows of show business. Now, however, it looks as if an Indian Summer may be starting for Train; For I hear that he will soon have his first TV role in an episode of ITV's comedy, Swindley. I met Train in a small elegantly furnished house in London's South Kensington, where he lives with his second wife Fay--his first wife, May, died in 1953. At 63, his hair is grey and thinning, but he is still the sprightly joke-mongerlng Train I knew years ago. Nowadays his main income is from appearing at dinners and socials for big industrial firms -- and there Colonel Chinstrap lives on. He patted his poodle Buttons and said: "A new career in TV? you never know! The chocolate commercial is the only one I've appeared in, though years ago I did a few voices. I'm very good on voices and dialect, and I don't understand why I've not been offered more television work." He chuckled: "But my only complaint is that I haven't been asked to advertise Scotch on TV. "I'm still doing all right, though I would like more work. I can't afford to retire and I wouldn't if I could, but with the march of time work isn't as frequent as it, was. "For many years I didn't have to look for work. Now I don't know how to. I don't like to ask". He chuckled again and added; "But you can tell everybody I'm still at the same address -- and I'm cheaper than I used to be !" In his early years, Train struggled hard to establish himself. Now he frankly admitted: "Without the Colonel I might never have become widely known. "Now I look upon Chinstrap as another me. I've really enjoyed that character, The funny thing is that when I first started playing him I hardly drank at all. But people assumed I was as big a toper as Chinstrap and they were always offering me drinks. "Many a time I was told : 'When I was a kid we had to keep quiet in our house when ITMA was on.' In public, people still come-up to me and talk about Chinstrap. -They don't recognise my face so much--it's usually when they hear me talking. I've one of the most distinctive voices in Britain. People always recognise it."